The new introduction of a faster colonising and more voracious predatory mite from Syngenta Bioline can now provide more effective control of thrips and whitefly in a range of protected flowers, fruit and vegetable crops. Montyline am will control pests for longer across a wider range of conditions, compared to the commonly used Amblyseius swirskii mites. Trials and independent research has shown that the Amblyseius montdorensis mites in Montyline am will eat up to four times the number of thrips per day, compared to A. swirskii. Furthermore, only A. montdorensis mites (below) consumed 2nd instar thrips - increasing the flexibility and efficacy of Montyline am in protecting crops. Launched earlier this month, (2 February) Syngenta Bioline Field Development Manager, Dr Richard GreatRex, says that A. montdorensis mites can survive as adults and larvae up to three times longer when conditions cool, compared to A. swirskii. "Importantly for growers, A. montdorensis becomes active earlier in the spring and will continue to control pests for longer as temperatures decline in the autumn. "When Montyline am is introduced into the crop, we very quickly see that the highly mobile mites spread themselves from top to bottom of the plant. This enhanced distribution through the crop remains for the duration of the season and provides more effective pest control," he said. Dr GreatRex added A. montdorensis lays more eggs when feeding on either pollen or pests, ensuring good populations are continuously present to counter pest attacks. Dutch-based Syngenta Bioline technical specialist, Martin Zuijderwijk, reported Montyline am has achieved increased levels of pest control in trials, including 97% control of whitefly populations in cucumbers and over 90% reduction in thrips in chrysanthemums, for example. "Trials on cucumbers and aubergines grown in the Mediterranean showed Montyline am gave superior control of both thrips and whitefly through the season. The result was fewer pests remaining to damage the crop over the winter and spring." The introduction of A. montdorensis in Montyline am has only been made possible with innovative new biological breeding techniques developed by Syngenta Bioline, according to Dr Richard GreatRex. "Research had identified the potential of A. montdorensis as the most active thrip predator, but that it proved extremely difficult to produce as a commercial beneficial for growers. "Our new Bioline production techniques, unique product formulation and breeding sachets has made this exciting potential a reality, and provides the optimal release mechanism for this strong predator." Montytline am has already gained regulatory approval for use in the UK and Netherlands, with further availability for other countries across Europe and worldwide subject to local regulatory requirements and the granting of appropriate permits. Dr GreatRex believes the extended season of biological control offered by Montyline am will prove especially valuable to growers and retailers seeking produce grown under the optimum Integrated Crop Management (ICM) protocols. He highlighted thrip feeding activity on plant leaves results in distorted fruits and blemished leaves; curled cucumbers are unsalable and the value of marked flowers seriously reduced. Whitefly infestation causes honeydew deposits and unsightly black mould, as well as spreading virus disease. "Montyline am provides effective control of both key pests in a range of important protected flowers and vegetable crops, and with greater flexibility to use across Europe and north Africa throughout the full range of protected crop growing systems," he advised. 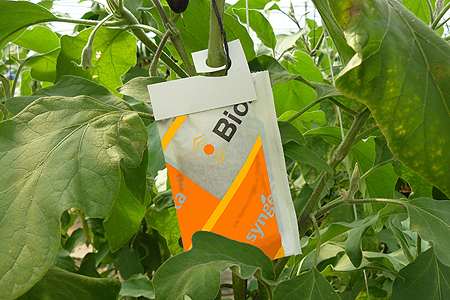 Montyline am is available in the company’s innovative mini-sachet system for fast and uniform distribution of mites in the crop and the easy to apply Bugline for use in ornamental crops.